I’m Mateusz, though most people refer to me as Mat (makes things a bit easier). Really looking forward to participating in this class and working on assignments. I’ve been trying to get into creative coding for a few months off and on. My hope is that this class will be the motivation I need to get a bunch of projects out the door and give me a kick in the pants. I’ve been programming in some capacity since I got my first computer when I was 14, so almost 14 years now! Currently I’m doing most of my coding in HTML, CSS, and JS for my day job. 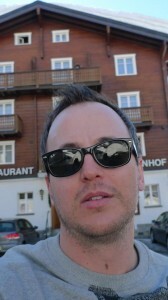 Hi, my name is Kamen Dimitrov, a creative coder based and born in Bulgaria. Thanks for Twitter and Golan, I am going to be part of the virtual students crew for the course. On a personal note, I am a total tech geek, music enthusiast and in love with digital art and media. I have been working as a programmer for the last 14 years, from web developing to running and managing my own small Internet company, to making mobile and interactive applications. I have always been interested in user experience and how people interact with things, so after I had the chance to visit ARS Electornica festival in 2010 and meet and see so many great artists, I got acquainted with the world of Interactive Media. So the first thing I did, when I got back was installing Openframeworks, and two years later, it is what I want to do my whole life – make interactive software and art! I am a 1st year master in eBiz with CS and law in my undergraduate. Although as a programmer mostly with J2EE, Rails and Android, I am also a TEDx curator, an Irish step dancer, a traveller and a hobbyist photographer. I am relatively new to interactive design. Anything learned from you will be my big step. A lot of my works slipped away when I lost my old PC. I learned a good lesson to show my portfolio and always use Git and Github to manage my works. This entry was posted in project-0 and tagged project-0 on 14 Jan 2013 by Alan. Hi, I’m Ziyun! Or you can…call me Z! :) I am a first year Music Technology master student – a musician, maker and programmer who have always been interested in the topic “Art and Technology”. Anything that’s experimental, that is new to me would be to my interest. I did a few experiments with arduino and max/msp where I turned an ordinary plant into a sensor that reacts to human body. 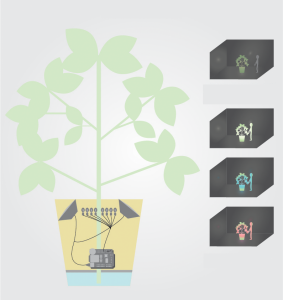 Interactive plant -demo from kaikai on Vimeo. Interactive Mini Worlds from kaikai on Vimeo. I am Andrew Bueno, a BCSA Junior originally from New Jersey. I enjoy the act of storytelling, with most of my work in some way at least tangentially related to it. 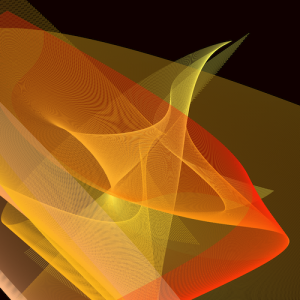 I love to work with code and the moving image. Outside of the “art world,” I enjoy performing on stage – I’m a member of CMU’s improv comedy troupe the No Parking Players and of Scotch ‘n’ Soda theater. 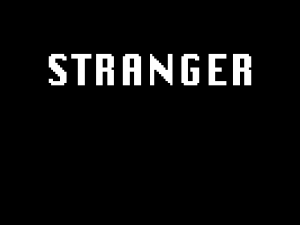 Last semester, as part of Paolo Pedercini’s Experimental Game Design studio, Eric Mackie and I created a game called Stranger using GameMaker 8. My contribution to the project was the entire code behind the game, and the integration of art assets provided by Eric into a finished product. This is actually one of only a few collaborations on an art project I have ever done at CMU. At this time I have yet to record video of the game. Stranger is, at its core, a game about choice. 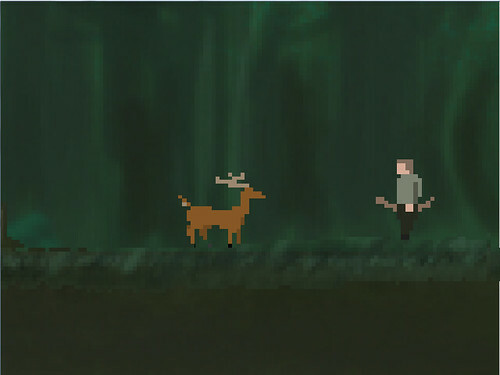 The character you control, a hunter armed with a bow, is given no characterization of his own beyond your actions, which consist entirely of conversing with other characters or choosing to kill them (we made sure that in several cases, there might be an ethical motivation to do so on the player’s part). The player walks through a forest, mountains, a gorge, and crumbling ruins over three seasons. 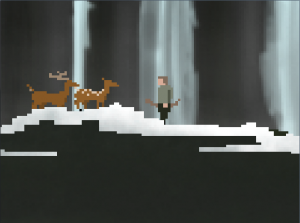 The effects of the player’s actions are shown in the landscape and the current inhabitants of the area. For example, should the player kill a slaver whipping a slave line along in the gorge in spring, the freed slaves can be found making camp there in the fall. Should the player do nothing, the slaves and slaver are found in the fall at the ruins, where they are building a castle for a nobleman. The project was a success in that it keeps track of a rather massive amount of possible game states based on player choice. We did a good job keeping track of what seemed to be initially a rather simple choice tree (which ended up more like a choice explosion). This craziness was disguised to the player, who was given only the essentials in terms of controls.The ambiance and atmosphere of the game is a wonderful combination of haunting and beautiful. That said, failure for me lied in the technique of the coding itself. It’s an example of a problem I have often in coding – workflow and code organization. Ultimately, choices were processed with a massive amount of if-else statements in game maker. It seems rather primitive and I’m hoping in the future to code with more finesse. There are still various visual bugs that need to be addressed, mostly due to the desire for correct choice processing over anything else. Overall though, it was an enjoyable project. I am currently a junior double majoring in Art and Human Computer Interaction, so this class it right up my ally. My interests include: making the tactile visual, large quantities of malleable materials (such as corn starch, wax, ferrofluids etc. 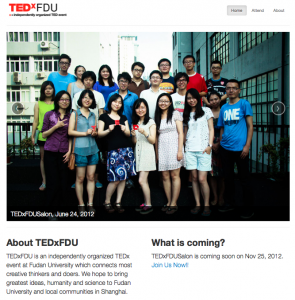 ), and TED talks. In this semester I am interested in expanding my tool set, pushing my existing interactive software based projects forward, and doing at least 3 completely new things. Heat has been an ongoing project that translates temperature into light and color. 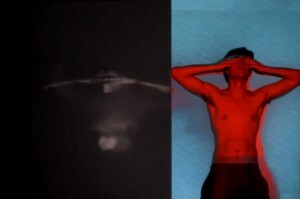 There have been three previous iterations of this projects: a series of 18 black and white video pieces exploring an intimate connection with landscape, a live interactive installation and a music video made in collaboration with cmu film club. Currently I am working on Stained Sheets which uses the medium of heat to explore movement and the physical act of mark making. My collaborators include Geoffrey P. Morgan (Computer Science Ph.D candidate at CMU) and The Pillow Project (experimental dance company). Our funding is provided by the Carnegie Mellon School of Art Interdisciplinary Grant and equipment from Professor Yang Cai. Hi guys, I’m a senior pursuing a Bachelor’s of Computer Science and Art. I’m most interested in working on art-related projects in the virtual spectrum, particularly games. I don’t have so much formal training in human-computer interaction but I would love to gain more experience and knowledge in that arena. In this class I hope to learn about a lot of new digital tools and am really excited to meet and work with new people who share some of my interests and bring totally new perspectives and ways of thinking to my attention. The above screen shot is from a game I created last semester for Paolo’s Experimental Game Design class. The game’s icon is a tiny snow globe and the game itself is meant to sit on your desktop the same way that a snow globe would sit on your shelf. However, unlike a normal snow globe which only allows you to shake and observe, Snow Globe (the game) gives you the opportunity to affect what goes on inside the snow globe. At the beginning of the game, you control a girl that lives in the initial empty landscape within the snow globe. Given that it is a snow globe, this is a very cold environment for her to be living in, so you need to build her some shelter in order to keep her alive. 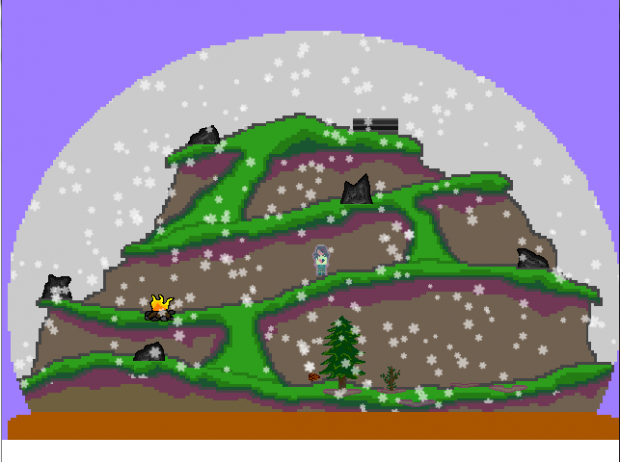 The snow globe has a small ecosystem which you must learn and navigate in order to do so, namely involving picking up object to plant and cut down trees, build a fire, and build a permanent shelter. However, there is a small catch: you can only see and pick up these objects when the snow has not settled over top of them. Therefore, you must constantly shake the snow globe by closing and re-opening the game to continue the game. The game will end in one of two ways, and once it does, you will no longer be able to play, you can simply observe (unless you restart the game). I’m pretty happy with the way the game turned out; I think I succeeded in created a coherent world both in terms of the graphics and the ecosystem. If I were to go back and improve upon it, I would focus mostly on timing and pacing; I was working on the game up to the last minute so I made decisions about these things based on guesses and didn’t have so much time to test them out. I also might rework the tutorial somewhat, it’s a bit wordy. If you’re interested in playing the game you can download it here: http://www.andrew.cmu.edu/user/elazrus/Games/SnowGlobe2/. I’m using this site temporarily store some of my work online while I am working on my website so I made update this link in the near future. Snow Globe from Erica Lazrus on Vimeo. I’m a 2nd year IxD masters student. Before coming back to school I designed websites, built props and taught. I’m interested in making things that make noise [possibly instruments, possibly not], things that make people work together, and things that look very very nice. I’ve got a lot of experience in HTML/CSS, JS, Processing and Max/MSP, and Adobe CS. I’m generally much more comfortable with software than with hardware and I’d like to change that. Dr. Dummy is multi-user, web-based drum machine designed to allow many people to create music collaboratively. Dr. Dummy is built using node.js, socket.io and the audiolet audio library. The basic idea is simple. Users go to the site, select an instrument and are then given a single track of sixteen switches representing drum beats. Users can toggle beats off and on and as multiple users do this, complex rhythms are created by the drum machine. This project is still a work in progress. I’m currently adding voices which can be controlled through accelerometer events on smartphone clients. Unfortunately, the project doesn’t exist on the web right now though it’s easy to run it on your local network. You can download the entire thing here. You’ll need to install node.js (from the link above) and review the readme.txt file which explains how to launch and use the project. It sounds much better if your machine is hooked up to real speakers. Don’t forget to dance! I’m really looking forward to the semester. See you soon! Hey! I’m Anna: a second year master’s student in the school of design. I’d say I’m about 2 parts bio-engineer, 3 parts visual designer, and 5 parts creative writer. You will [quickly, I imagine] find that I am enthusiastic about medical technology, healthcare, typography, colors, novels, characters, metaphors, words, and words. I know a thing or two about code from my time moonlighting as an engineer, but for the most part I’ve kept programming tied to left-brain projects like bio-transport models, and made art the old school way—physical objects, pen on paper, and crayons on walls. I’m excited about this class because I’m hoping to break down some of those barriers. In case you didn’t believe me when I claimed to be enthusiastic about words, here’s a [very] modest flash project I made for a prototyping course last year. ‘A Dozen Reams of Nonsense’ pulls in XML data about all of the creative writing text files I have on my computer, dynamically draws triangles, fills them to a percentage that corresponds to a value judgment about the words inside the file—obviously, I was the one who made the judgments, not the program, although that would be pretty nifty. 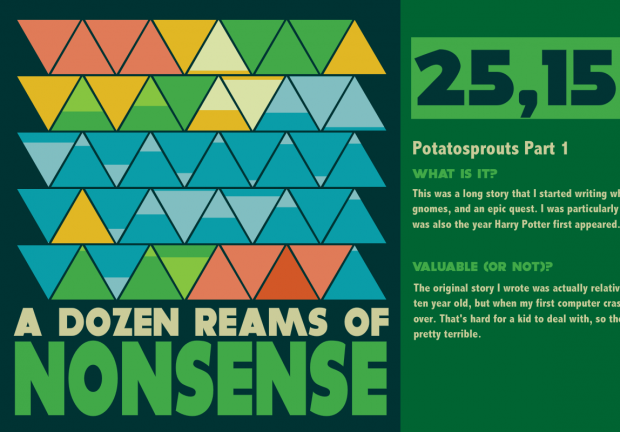 As you can read if you visit the live version [ http://avreden.com/wordcount.html ], my goal in visualizing all the words I’ve written was to quantify exactly how much useless stuff writers produce before they ever come up with something they like. So many people become frustrated when they sit down in front of a blank page because they have a ‘one shot at glory,’ do-or-die mentality. It would be fascinating to see what the percentages would look like for various famous authors in today’s society, and through history. I expect it would feel cathartic to everyone. … that sounds a bit scary though. My name is Mike Taylor. I’m a PhD student in the Robotics Institute under Professor Illah Nourbakhsh. I’m a bit slow at typing and many other things because I shattered my dominant right arm at the beginning of 2013, and as of now I’m effectively one-handed. I don’t expect to regain full use before 2014. Please bear with me; It’s going to be a bit of a rough semester as I relearn to do everything with my left hand. On the plus side, my right elbow is now mostly stainless steel plates and lag bolts, and I think that’s a little cool. I’m interested in creating new ways to extract and convey meaning from large amounts of non-homogeneous data. In my free time, I like to make shiny things and unicycle (though neither of those things are what took my arm). Through this course, I’m hoping to develop my skills across a wider range of software while exploring new ways to effectively communicate complex ideas through diverse media. In the Fall of 2011, I stayed at a rural hospital in Haiti to asses the post-earthquake rubble moving problem. I found that the lack of energy infrastructure is not only a hindrance to removing rubble, but is a much deeper and difficult problem to approach. 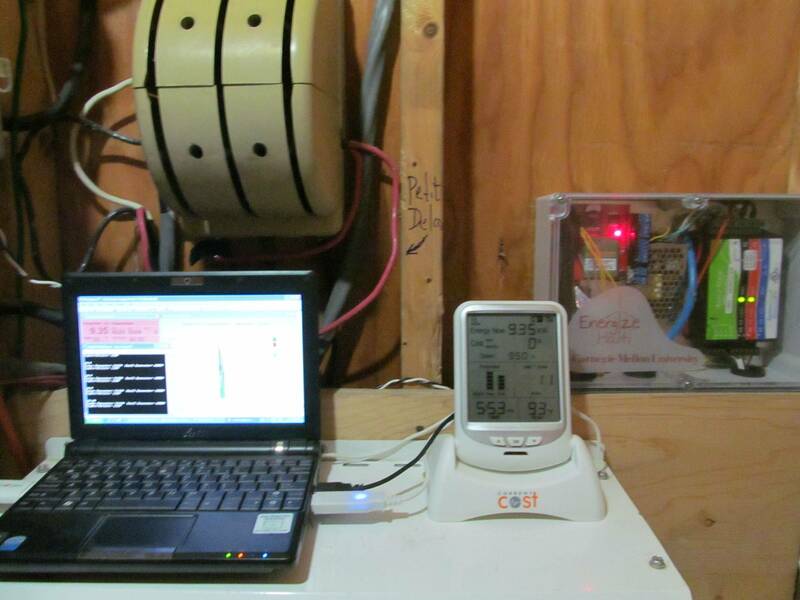 I established a goal of creating tools to provide quantitative information regarding electricity usage and generation to hospitals, schools, etc. while also providing a qualitative understanding of energy to the population (especially children). 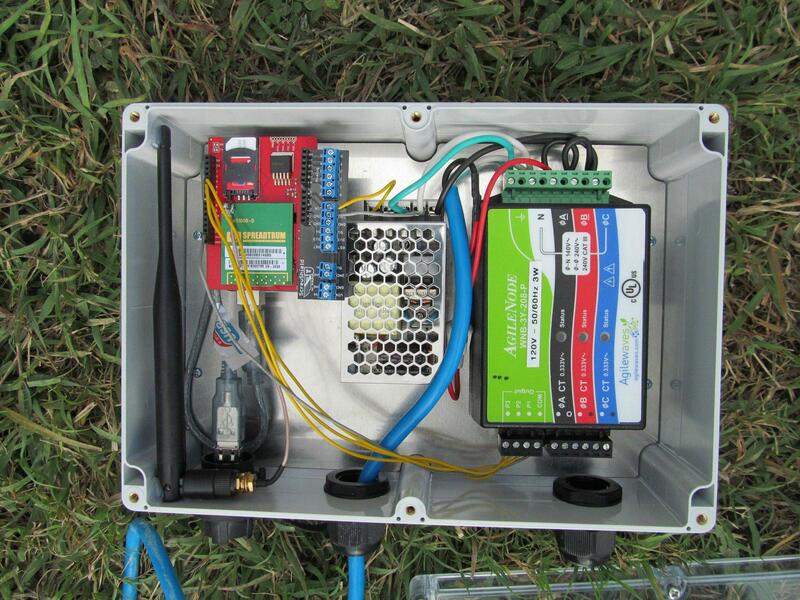 This device is a prototype energy monitor built using readily available hardware and open-source software that monitors power usage through three different electrical circuits and measures voltage across one 48v battery bank. I installed this at the hospital in June of 2012, and to my knowledge it has functioned without interruption. I used an Arduino to convert the pulses from the power monitor to usable values. These are logged to a microSD card every second. The device exports this data in several ways for redundancy. By serial link, the data can be viewed live on-site through a small netbook computer. The netbook can be accessed remotely by a 3G USB modem. Because the 3G network is less than a year old in Haiti and prone to failure, the Arduino also communicates via SMS through a gsm modem and SIM card. 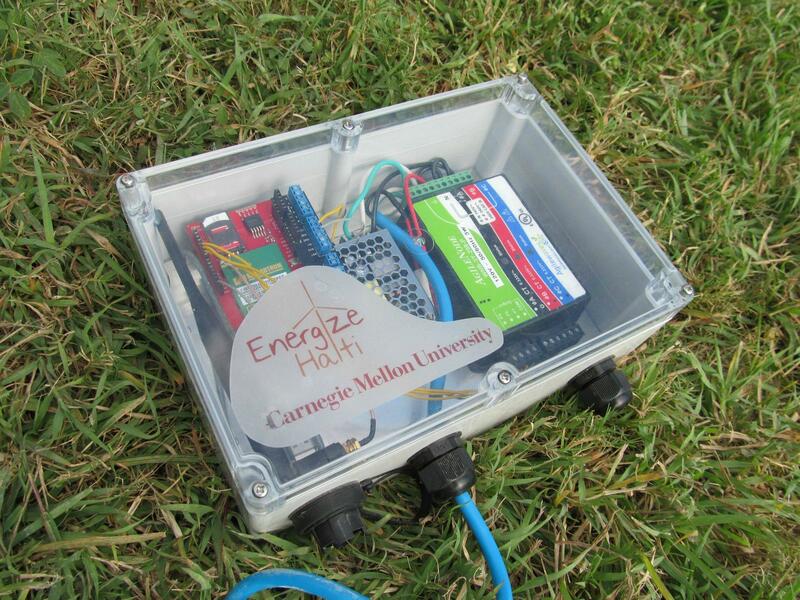 Twice daily, the device sends a text with hourly power usage to a google voice number which archives the data. Any user at the hospital can also send a text to the device in order to receive an instantaneous power usage update, giving nurses, patients, teachers and students access to the information at any hour. One feature I am rather proud of is the way in which the device synchronizes the time and date without a real-time clock. Whenever the device receives a text, it scrapes the time and date. If it is within a certain tolerance of the last known date and time, the device updates its clock. I hope to return this summer, arm permitting, to improve the user interface and to scale out to more locations. While the hardware integration went remarkably well for having to design and test remotely, the interface fails at being an effective educational tool insomuch as it is primarily textual. I believe I can use my experience in this class to significantly improve the long-term educational benefits of this project. Thanks for reading, and I look forward to meeting you all!